Nicolas Jack Roeg CBE BSC (/ˈroʊɡ/; born 15 August 1928) is an English film director and cinematographer. After National Service he entered the film business as a tea boy moving up to clapper-loader, the bottom rung of the camera department, at Marylebone Studios in London. Early in his career Roeg was a second-unit cinematographer on Lawrence of Arabia, then cinematographer on Roger Corman's The Masque of the Red Death and François Truffaut's Fahrenheit 451. He co-directed and photographed Performance in 1970. He later directed such films as Walkabout, Don't Look Now and The Man Who Fell to Earth. Roeg's films are known for having scenes and images from the plot presented in a disarranged fashion, out of chronological and causal order, requiring the viewer to do the work of mentally rearranging them to comprehend the storyline. They seem, "to shatter reality into a thousand pieces" and are "unpredictable, fascinating, cryptic and liable to leave you wondering what the hell just happened. ..."
A characteristic of Roeg's films is that they are edited in disjunctive and semi-coherent ways that make full sense only in the film's final moments, when a crucial piece of information surfaces; they are "mosaic-like montages [filled with] elliptical details which become very important later." These techniques, and Roeg's foreboding sense of atmosphere, influenced later filmmakers such as Steven Soderbergh, Tony Scott, Ridley Scott, François Ozon and Danny Boyle. Roeg's influence on cinema is not limited to deconstructing narrative. The "Memo From Turner" sequence in Performance predates many techniques later used in music videos. The "quadrant" sequence in Bad Timing, in which the thoughts of Theresa Russell and Art Garfunkel are heard before words are spoken, set to Keith Jarrett's piano music from the Köln Concert, stretched the boundaries of what could be done with film. His work was documented at the Riverside Studios, London from 12–14 September 2008, showcasing nine of his films. He introduced the retrospective along with Miranda Richardson, who starred in Puffball. The retrospective included Bad Timing, Puffball, Far from the Madding Crowd, The Man Who Fell to Earth, The Witches, Eureka, Don't Look Now and Insignificance. The London Film Academy organised this event for Roeg in honour of his patronage of the school. Roeg was born in London, to Mabel Gertrude (née Silk) and Jack Nicolas Roeg. Roeg was married to Susan Stephen from 1957–77. They had four children, Waldo, Nico, Sholto and the producer Luc Roeg, who also stars in Roeg's first film, Walkabout, as Lucien John. Roeg married Theresa Russell in 1982 and they had two children, Max (an actor) and Statten Roeg. Following their divorce, Roeg married Harriet Harper in 2004. ↑ "Screenonline". British Film Institute (BFI). BFI. ↑ Steve Rose. "'You don't know me. '", guardian.co.uk, 12 July 2008; accessed 12 July 2014. ↑ Jason Wood. "His Brilliant Career", The Guardian, 3 June 2005; accessed 10 July 2010. ↑ Ariel Leve. "Interview with Tony Scott", The Sunday Times Magazine. August 2005; accessed 12 July 2010. ↑ Adams, Tim "Danny Boyle: 'As soon as you think you can do whatever you want... then you're sunk'" The Guardian, 5 December 2010. ↑ Roeg profile, sensesofcinema.com; accessed 12 July 2014. ↑ Profile, filmreference.com; accessed 12 July 2014. Fragile Geometry: The Films, Philosophy and Misadventures of Nicolas Roeg, Joseph Lanza, New York: Paj Publications, 1989. 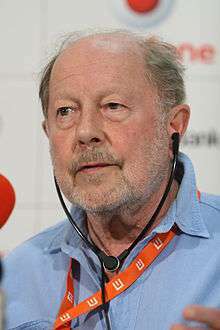 Wikimedia Commons has media related to Nicolas Roeg. Interview with Roeg from 1980 by Gerald Peary; accessed 12 July 2014. Tribute to Nicolas Roeg 2007, Academy of Motion Picture Arts and Sciences (photos.oscars.org); accessed 12 July 2014. Book Review: The World is Ever Changing by Nicolas Roeg, independent.co.uk; accessed 12 July 2014.